Is Pincoin a Scam or Legit Opportunity? Read My Review Before Signing Up! But again, just like the others that have came before this is a company that also runs recruiting alongside their “investment scheme” so what’s the deal – is this one actually legit or is Pincoin a scam that’ll just see you parted with your cash like the rest of these crypto-opportunities? Pincoin, or the Pincoin Community Project as they call themselves is basically a newly launched cryptocurrency that allegedly focuses on “sharing”. They claim they’ve launched to help people share assets, resources, time and skills more efficiently. However after just taking a short look around their website it’s very clear that the whole thing is geared towards a money-making opportunity, through which they promise returns of up to 40% per month. So high returns, a recruitment scheme & a so-called “sharing economy”… If that doesn’t scream Ponzi scheme then I don’t know what does. 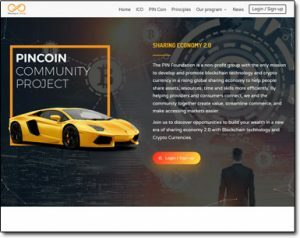 So yeah, I want to point out right away that in my opinion the whole Pincoin Community Project thing certainly looks an awful lot like a scam. And by the way, in case you didn’t see it in the news BitConnect was a similar company that was recently forced to close resulting in thousands of members losing their investments. Well firstly there’s Pincoin’s side of the story – they claim that they’ve created a revolutionary new cryptocurrency which will make for better “sharing”. You’re led to believe that if you therefore invest in the coin, it’s value is likely to increase in the future (according to them at least). However what’s much more likely to happen is that if you invest in the coin,you will be likely to find out that not so long down the line the company will be forced to close, leaving you short of your investment. The reason for that is because the reality here is that, in my opinion at least, Pincoin is merely a well covered-up money making opportunity (or should I say scheme). You invest money, and you get an ROI. That’s how Pincoin really works, which you’ll find out once you manage to navigate your way through all their spiel (aka the cover up). However this promised ROI is not safe, in fact it’s totally the opposite. And let me also start by saying again those promised ROI figures are insane… Ludicrous… and most importantly, impossible – from a legitimate scheme at least. I mean come on, if there was a legitimate way to invest $10,000 and turn it into $80,000 or $250k and turn it into $2.5 million then everybody would be doing it – we’d be hearing about this thing from the news, not via some spam email. The reason we’re not hearing about it via the news is because like the majority of the other cryptocurrency schemes out there it’s complete utter garbage & the chances are you will lose all of your money, not make any. That’s because going off those ROI figures it’s clear to see that the company is operating a massive Ponzi scheme. This basically means that you invest, then they’re using the investments from the new members coming in after you to pay you off… That’s why there’s such a heavy push on getting you to bring new people in too. But the problem is that this business model is totally unsustainable, at some point there won’t be enough new people coming in to pay off the old members & this is when the whole thing will collapse & disappear. Disappearing with your money too. Whenever you’re looking into any sort of investment opportunity there are 2 things you should immediately look for before even looking for anything else. Those 2 things are the owners details (such as the company behind the operation) and the owners license from their countries regulating body. You should also check up on them to make sure they’re actually legit, because I’ve known some websites use fake details. It’s easy to do, all you need to do is search the given license number against the register & see if it holds up with their company name. You should never, ever trust a company who doesn’t even do as much as to show you who’s behind it (like Pincoin). The reason for that is because that’s a massive common trait of a scam. Scammers hide their details from their sites so that when they do collapse they can simply launch another one under a completely different name & continue the scam without any trace whatsoever. Despite their website being very detailed & almost looking legitimate, Pincoin definitely displays all the common traits of a scam for sure. They also provide absolutely no information as to who owns it. Basically there is no way I would even investment so much as $1 with this company, let alone $100… and NO WAY $250,000. My Verdict – Is Pincoin a Scam? With the crazily high promised ROI’s & the lack of information as to who actually runs the company I can say confidently that Pincoin does indeed look like a scam. I believe it’s nothing more than a mere Ponzi scheme. Sadly with the fact that cryptocurrency transactions are untraceable there are more & more of these things launching everyday so when it comes to looking at cryptocurrency opportunities it pays to do your due diligence. These types of companies are just looking to jump on the ever increasing hype of crypto & take advantage of the new people that are looking to get started with it & looking to make lot’s of money quickly. So overall I am going to be giving the whole Pincoin Community Project thing a big thumbs down because as far as I’m concerned it’s certainly not legitimate & it’s something you should definitely avoid. Avisae Review – Is It a Pyramid Scheme Type Scam? Or Legit MLM Company?